The British Gazette » Brexit: Hoping for the best. Planning for the worst. Above, Victoria Pendleton, CBE an Olympic cycling champion and now a British jockey. Riding a track bike and a racehorse not only takes physical stamina and strength, it also takes great courage for the risks involved, particularly in Mrs Gardner’s subsequent activity are huge. Falling off a galloping racehorse can (and does for some) result in death or life changing injury. Clearly, Mrs Gardner feels the risk is worth the reward. Mrs Gardner is not a fool. For her it is a calculated risk and one she diligently trains and prepares for. For her achievements, Mrs Gardener has been invested third class British Empire. As the farce that some wit might in future write up as “the Brexit Diaries” continues, the possibility that some in the EU may be planning their own very high risk venture it is becoming worryingly greater. High risk in the sense of being defined as risk (of dire economic consequences for the EU and particularly those countries in the Eurozone) to them – not the UK. The excellent Mr Christopher Booker in his column in the Daily Telegraph together with the British Gazette and Doctor Richard North’s blog, EUReferendum (http://eureferendum.com/) have for some time now been persistently attempting to inform and educate any and all who will listen to the problems and dangers associated with mishandling the Brexit negotiations. Today’s article does not simply regurgitate previous remonstrances but instead addresses an issue of great interest to many readers who are members of UKIP. The future of UKIP and what they should do. For many not in UKIP these are questions to which they attach no importance at all. However many readers who are UKIP members have invested huge amounts of time and energy into promoting a party they passionately believe in. Many will also have made significant financial contributions. For most of these members, “Hard Brexit” holds no fears! Many in fact look forward to it! These people look forward to “Hard Brexit” because they are wholly ignorant of the dire effects “Hard Brexit” will have. They are either deluding themselves or are being deluded by others – principally Mr Paul Nuttall. “Hard Brexit” will be an economic disaster for the UK. Because Mr Nuttall has and will doubtless continue to nail UKIP’s colours so prominently to this particular mask, UKIP will have brought upon itself all of the ire and contempt an outraged British electorate can give to those they will blame for their predicament. UKIP will likely cease to exist. All the time, energy, effort and money put in by those British Gazette readers who are UKIP members will have been wasted. This for them will be a personal disaster. This is because many British Gazette readers have been campaigning against what is now the EU for decades. Many campaigned against the UK joining what was then touted as “the Common Market”. They campaigned for a leave vote in the United Kingdom European Communities referendum held on Thursday 5th June 1975. 41 years and 18 days later on Thursday 23rd June 2016, their dream looked set to be realised. A certain Nigel Farage declared that this day should be known as UK Independence Day. Since those who took an active part in the 1975 referendum were if not adults, teenagers, those readers have spent most of their lives campaigning against the unlawful governance of Her Majesty’s realm that constitutes the United Kingdom of Great Britain and Northern Ireland. That “Hard Brexit” will be an economic disaster for the UK will be borne out if and when it happens. 1. Adopting Flexcit as the UK’s negotiating position and succeeding in bring the negotiation to a successful conclusion. 2. Abandon Brexit and remain in the EU on present terms. The High Risk (of dire economic consequences for the EU and particularly those countries in the Eurozone) strategy that might be planned and adopted by some in the EU is to not prevent the UK from performing a “Hard Brexit” and to organise affairs in the EU to allow for the offer of the enactment of an Emergency Readmission Treaty to allow the UK to re-enter the EU backdated to one minute (or another legally suitable passage of time) after the UK left OR not backdated at all. Such a treaty would have to pass through the legislative processes of all 27 EU member states and in several, referendums. The UK would have to do likewise. Under the Treaty of Lisbon, any new member of the EU – and in these circumstances the UK would be a new member – membership of the Eurozone is a requirement. In a previous article (http://www.british-gazette.co.uk/2009/10/24/parity-parity-beware-of-parity/), we drew attention to the dangers of a situation where Sterling trades more or less at parity with the Euro. This is because at parity the mechanics of the UK entering the Eurozone are straightforward. Notes and coin would be exchanged on a 1:1 basis and bank accounts and goods in shops would merely have a change of currency symbol. Whilst the level of support (48%) for UK’s EU membership was demonstrated most prominently on Thursday 23rd June 2016 and at that point it can be confidently assumed, only a modest proportion of that number would have supported UK entry into the Eurozone and with it abandonment of Sterling, the situation would be very different following the economic and logistical chaos following a “Hard Brexit”. Furthermore, in two years time – from May 2017 – all those teenagers who were 16 and 17 years old in June 2016 will be over 18 and on the electoral role! The strategy of these Euro-federalists is clear: they wish to keep the European Project on track. For this to happen it would be most helpful were Brexit to fail and fail spectacularly! Of course, the EU and the European Project has two parts: there is the EU and there is the Eurozone. They are like conjoined twins sharing several organs between them. If one fails, the other fails. It is a central objective of those who control the Eurozone to see that it survives. The Eurozone was of course flawed. The Eurozone members shared a common currency but retained their sovereign debts – and the authority to increase them. Furthermore, certain members, most notably Greece presented national books of account that were to coin a phrase “economical with the actualité”. Those drawing up the Eurozone project however had envisioned the UK being party to it which would have brought the City of London into the Eurozone and with it it’s international financial clout and in addition a major EU economy. Eurocrats have a phrase and a term: “Beneficial Crisis” – which is taken to mean that crises that crop up from time to time should be viewed as opportunities to be taken advantage of to further the Great European Project. 1. They would secure the UK as a member of the EU. 2. They would secure the UK as a member of the Eurozone – thus providing a huge injection of resources to keep the project afloat. 3. They would be able to luxuriate in gargantuan quantities of schadenfreude – a German noun meaning the pleasure derived by someone from another person’s misfortune! And we know the identity of the “someone” and “another person”. That someone of course being Guy Verhofstadt, the EU Parliament’s Brexit negotiator and the “another person” being a certain Nigel Farage! A particular feature of Mr Verhofstadt’s pleasure will be that fact that UKIP and the Unfortunate Nuttall will have done much to hand Mr Verhofstadt his victory! This is because it will have been the Unfortunate Nuttall’s vigorous and persistent protestations for the desirability of a “Hard Brexit” backed up of course by many enthusiastic UKippers demanding the same thing! 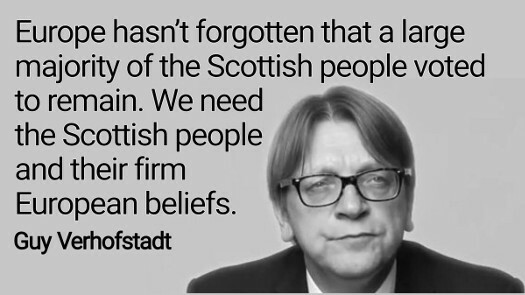 It is likely that Mr Verhofstadt will not so much regard these folk as “useful idiots” but “essential idiots” for their actions will have brought about the very thing necessary for Mr Verhofstadt and his Euro-federalist comrades to be able to breath much further life into the European Project and the Euroone for not only will they have secured the continued UK membership of the EU, they would have brought the UK into the Eurozone, destroyed for a generation political support for Brexit and have dealt a hammer blow to similar movements gathering strength in other EU member states! It will be extraordinarily difficult for Mr Verhofstadt to keep a straight face were he top meet the Unfortunate Nuttall in the environs of the EU Parliament for he would have the Unfortunate Nuttall to thank for saving his European dream! Let us not forget what the EU Parliament’s negotiator said of Scotland: So….. What should we Eurorealists do? We may well be approaching a point in the not too far distant future when it will be essential to dissociate ourselves with the upcoming train crash which is UKIP. This is because it will be necessary to have a group of us who are relatively untainted by the chaos that will have been “Hard Brexit”! As a single issue group we would be able to attempt to secure support across the political spectrum. This is essential for we should be planning now for the eventuality – which we hope will not occur – of UK readmission into the EU and admission into the Eurozone. SoB should campaign for Flexcit to be adopted as the UK’s negotiating position. Hopefully our efforts will not be needed as Mrs May well be doing just that but obtaining the EU’s agreement to call it “the Transitional Arrangement.” If this does not occur however and we are faced with the disaster of “Hard Brexit” we need to have nailed our colours to the “Soft Brexit” mast to avoid being made an irrelevance like UKIP and the Unfortunate Nuttall.